First, if you don’t like to read instructions, your IKEA furniture probably won’t last very long. Second, if you don’t go to visit Turber none of this will not make any sense to you but you still risk going to Hell. Answer 1o questions about yourself or risk breaking the chain of sunshine (this includes the threat of Hell, bad luck for seven years, an influx of all things ORANGE, and the inability to find any Alan Rickman movies). Facebook or Twitter: ORANGE you glad i didn’t say Facebook? My passion: anything that gets me out of bed in the morning…and this morning it’s ORANGES! Prefer giving or getting presents: I like GETTING oranges! My favorite day of the week: any day I’m eating ORANGES! Good Luck to everyone in their mission to keep the cycle of Sunshine going! P.S. You’d better look up the real instructions cause I may not have done this very well…also, my furniture if falling apart. See you in Hell! Hi Jenn 🙂 I’m guessing you’ll be able to tell me after you’ve completed your spreading of sunshine. Can’t wait to hear how it goes. Good Luck! I am shocked! What do you mean with: white tulip? Don’t you want to think about that again, dear? very much hope that you enjoyed the blog! 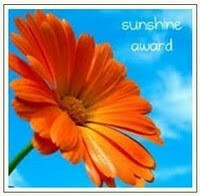 I was very appreciative of your nomination for the sunshine award. You have yourself an absolutely orange day.